People were happy to rediscover the role of their minuscule existence in framing of the national policy; they were happy to get an occasion to vote. In short, India was celebrating its democracy and there is a clear sense of satisfaction in that celebration. Election is the process through which a political ideal called democracy comes into existence. One may expect that the mandate of an election embodies all the principles that one expects to be satisfied by a representative democracy. It is these principles that make democracy a political ideal. Equality in voting is one of these principles that we cherish. Someone who believes in a minimalist definition of democracy may argue that barring few exceptions of intimidation to voters and rigging (which clearly are violations of the principle) this principle has been largely fulfilled as most people in the country who wished to participate in the process have been able to do so in a fair manner. It is however a matter of choice whether one would like to go by the minimalist definition or to go beyond it. It is quite unlikely that the satisfaction associated with democracy comes from one's equal ability to press a button on the voting machine. Equality in voting means one's opinion commands equal importance than that of any other in the political decision making processes. A primary objective of a representative democracy is to represent people's opinions and desires in the decision making process. People send their representatives to the parliament to voice their opinions. If opinion of every citizen truly commands equal importance then it is imperative that each such opinion be represented in the decision making process. Choosing a representative is therefore just a means and not an end in itself for the realisation of the principle of equality in voting. The discussions and debates that take place in the parliament in the process of framing a policy is of no less importance for the realisation of the principle. Democracy gets defeated if either the representatives refrain from joining these debates and discussions (for whatever reason) and thereby fail to voice people's opinions or the representatives elected do not truly represent the composition of people's opinion in the country. We shall be focusing here on the role of the voting procedure that may generate the second type of defect that has just been mentioned. Voting procedure plays an important role in shaping up of the composition of parliament. The procedure that we follow in India is called the first past the post (FPTP) system. We inherited this system from our previous colonial rulers. In this system in each constituency the candidate who gathers largest number of votes wins. Winners from constituencies across the country represent the people and form the composition of the parliament. This apparently benign system has the potential to create serious problems for the realization of the principle we mentioned. This system is notorious for creating discrepancies between vote share of a party and its share of seats in the parliament. Some such discrepancies can be observed from the mandate of the last election and has been pointed out in several news paper articles following the election results. The largest political party BJP with 31% vote share in the country has 282 seats in the parliament which is 51% of all seats. The NDA with 38.5% vote share commands around 61% seats whereas non-NDA parties together got 61.5% of all votes polled but have 39% seats. The mismatch between the proportion of votes and seats can be quite arbitrary as well under the FPTP system. For example a party like TMC with 3.9% vote share wins 34 seats which is more than 6% of all seats whereas a party like BSP with 4.2% vote share gets no representation in the parliament. ADMK with 3.3% vote share manages to command 37 seats where as the two left parties CPIM and CPI together got 4% of country's vote but managed to get only 10 seats. With just 1.7% vote share BJD wins 20 seats whereas with 3.4% votes SP wins only 5 seats. Again INC with 19.3% vote share gets 44 seats in 2014 election where as in the last parliament BJP had 116 seats with just 18.5% vote share that they got in 2009 election. One can observe many such discrepancies from the past election data. We however, need to understand that these discrepancies have implications for the democratic discourse of this country and are too serious to be ignored as just some post-election amusing facts. It is a serious drawback for democracy because it does not allow to properly represent people's opinions in the decision making process. Opinions of a significantly large section of the population will either be not represented or be terribly under represented. In such a situation how far the decisions taken in the parliament (even after following all rules) are to be democratic in true sense, can be questioned. The defect that we are trying to point out here is not a fault of any participant of the election process or of any constitutional body that is involved in the process of running the election or government. The defect is in built in the voting process that we follow. With its potentiality to undermine valuable democratic principles, FPTP system can create far worse consequences. Imagine a hypothetical situation where ten candidates from 10 different parties are fighting for a constituency seat. Suppose each of them has more or less equal support base. Imagine farther that after election 8 candidates got a vote share of 10% each, one candidate got 9% vote share and the candidate from party number 10 got 11% vote share. If we farther imagine that this phenomenon gets replicated in all constituencies then with just 11% vote share from the entire country party number 10 would occupy all seats in the parliament with no traces of any opposition. People who favour the FPTP system because they believe it provides stable government cannot expect anything more stable. However, such stability comes at the cost of democratic values. Consider another example (table 1). We have a parliament with three constituencies and in each constituency there are 10 voters. Following table shows the number of votes polled in favour of each of the three contesting parties in each of the three constituencies. Notice that under FPTP system Party A gets only 9 votes but forms the government by winning 2 out of 3 seats. Party B gets 12 votes but sits in the opposition by winning just 1 seat. Party C has same number of supporters as Party A; but does not get the opportunity to represent them in the parliament. Clearly one does not expect this as a democratic outcome. The previous two hypothetical examples brought out a fundamental problem of the first past the post system, namely its inadequacy to deliver an outcome that goes with the spirit of a democracy. Some people may like to discard these examples by arguing that these are pathological or extreme cases. But we need to remember that robustness of a system can only be tested by looking at how well it handles extreme situations. This article, although written against the backdrop of 2014 Lok Sabha election results, is neither to celebrate nor to criticize the mandate per se. The article has been motivated by an old, well known to a section of academia, but less discussed limitation of the voting process. There has been a suspicion that the phenomenon of a democracy being a victim of this limitation may not be a rare event. That suspicion got vindicated by the results of the last election. 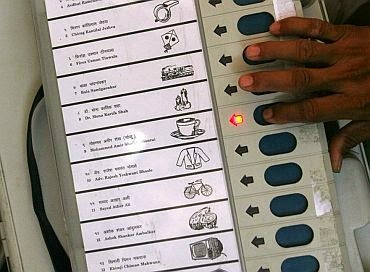 There is no denial of the fact that FPTP is a popular voting mechanism used in many countries including United States and United Kingdom apart from India. But there is also no denial that its popularity is dwindling and its effectiveness increasingly being questioned. There are many alternative voting procedures regularly used in several other countries. This is not to argue that any of those alternative procedures will be a perfect system. But surely it is worth to find out how effective they would be in satisfying some of the principles of democracy; principles that we would like to observe in our democracy. While we all like to celebrate our democracy we spend little time to ponder about the process through which we achieve it. Elections are an integral part of democracy. A voting procedure is the means through which an abstract concept of democracy gets translated into reality. It is worth to revisit and question whether the voting procedure in its present form commensurate with the concept of democracy that we cherish so much. The author is Assistant Professor, School of Liberal Studies Ambedkar University, Delhi.